Assault troops of the US Army's 2nd Battalion, 165th Infantry Regiment, 27th Infantry Division land on Yellow Beach at 1040 Hours. Caught between two piers that mounted machine guns that could sweep the 6,000 yards (5480 meters) of the landing area, the Landing Craft Vehicle and Personnel (LCVP Higgins boats) ground on the reef 1,000 yards (914 meters) out. The LCVP in the center left of the picture is probably from USS Neville (APA-9). Off the western entrance to Makin Lagoon, the Neville commenced lowering her landing craft at 0840 Hours and a new landing ship dock, USS Belle Grove (LSD-2), began launching her LCMs at 0910. The LSD had 16 in the water in the next 12 minutes.The first wave was made up of 16 amtracs launched from LST-179. The second and third waves were eight LCMs and seven LCMs respectively carrying M3 medium tanks launched from the Belle Grove. Using eleven landing craft from USS Alcyone (AKA-7) and twenty-four which had been brought on the Neville, the 2nd Battalion made its way toward Yellow Beach against a smooth ground swell, leaving the GIs to wade in in waist-deep. 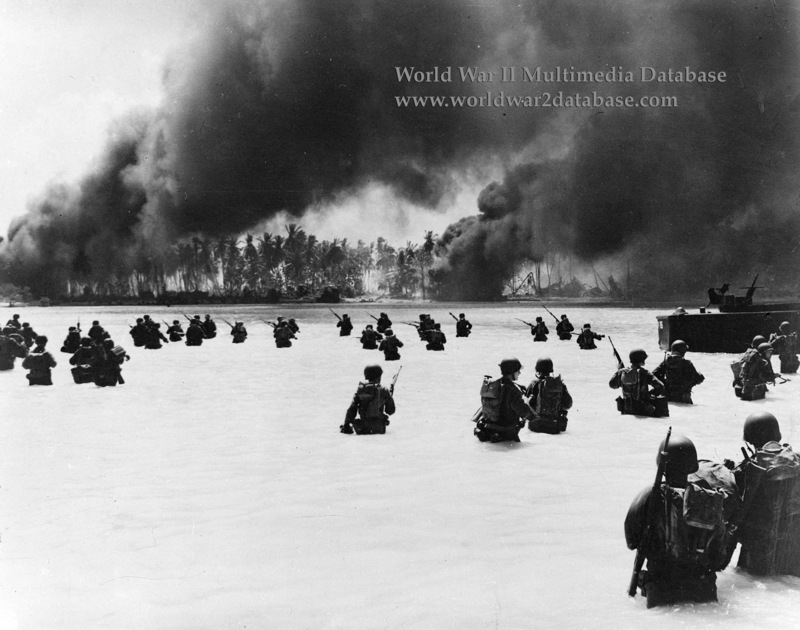 Companies E, F, and part of G, and Heavy Weapons Company H of the 165th Infantry, one platoon of Company C, 102nd Engineers, some medical detachments, and the Yellow Beach Shore Party to direct and unload cargo were disembarked by the Neville. From the Belle Grove came Company A, 193rd Tank Battalion, with their M3 Grant medium tanks, and the the 98th Coast Artillery (part of Battery A and the headquarters). Besides the Alligators and their occupants, the LST 179 sent in the headquarters section of 193rd Tank Battalion (M3 Stuart light tanks) and two antiaircraft detachments (Battery D and part of Battery A, 98th CA). The Neville logged the assault waves' landing at Yellow Beach Two at 1040, 1041, 1043, 1045, 1050, 1056, 1101, and 1108.